Buyers of fruits, such as apples and pears, have stringent demands when it comes to fruit hygiene. Depending on the retailer and destination, very little or absolutely no detectable pathogens are allowed to be present on the peel of the fruit. At the same time, companies supplying these fruits are also faced with strict residue standards. These standards are placed on the methods used to prevent the formation of these germs. 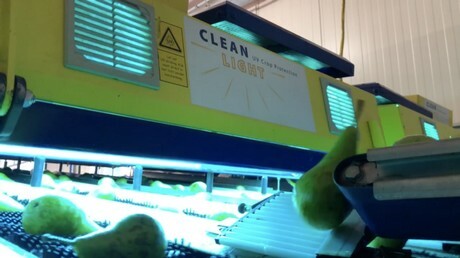 This is why CleanLight wanted to determine whether their sanitation technique would be effective on top fruit too. This Dutch company is already known for using this method in the flower bulb cultivation sector. CleanLight's Maarten van Eijk says, "Disinfecting UV light is already being quite widely used in the flower bulb sector." "This type of light is used to combat fungi such as Fusarium. This fungus is found on the bulbs of, for example, tulips. It is not always possible to achieve a 100% kill rate. However, a reduction of 75% is easily achieved with tulip bulbs when using this technique." Damian van Dijk of CleanLight continues. “Compared to flower bulbs, a pear processing plant is wonderfully clean and neat. There is no mud on the product. So, we had high expectations in terms of results. We installed two UV hoods at a respected pear processor." "This meant that all the pears had to pass under the UV Light. They did so in such a way that the entire surface of the pear was exposed to the light. We then got GroenAgro Control to take measurements that would show the effect of the light on the pears." “Initially, the trials gave confusing results", says Michel Witmer of Groen Agro Control. This Dutch company does laboratory analyses for the agricultural sector. "We had to find out what was causing this. After conducting different tests, we came to the conclusion that the UV light itself was working correctly." "However, the brushes that the pears were rolling on were a source of re-contamination. After all, germs that are found in a warm, damp place can multiply quickly. The light also does not reach them." “Another challenge for the project was that in many samples, the pears were already clean before they got treated. The lab report, therefore, showed the same values for pre and post-UV light treatment. This was, of course, correct but not very helpful for the grower", Witmer continues. After these problems were solved, the results were good. The appendix contains an example of a test where the possible disease levels were reduced by a factor of log 2. This is a cut of more than 90%. Arne Aiking of CleanLight concludes, “This is what we want to achieve for our clients. Not just for flower bulbs and vegetables, but also for top fruit. With this method, Dutch fruit is ideally suited for exportation to countries with strict standards regarding pathogens and disinfection substances." Click here for UV-Hood product sheet. Click here for the example of the microbiological analyses report.